Minimalist Japanese retailer Muji will open up to eight Canadian stores over the next five years, according to the president of Muji Canada. It has secured its first Canadian location in Toronto, with further locations to follow in Vancouver and, eventually, in other Canadian cities. Toru Tsunoda, president of Muji Canada, tells Reuters that Muji's plans to open seven or eight stores across Canada is part of a broader plan for the retailer to operate more stores overseas than in Japan within the next two years. Muji currently operates 255 stores outside of Japan, including 100 in China. It currently has 385 stores in Japan, meaning that it plans to open at least 130 new international stores before 2017. "I hope to open seven to eight (Canadian) stores in the next five years," said Mr. Tsunoda (in a Japanese language interview). "But opening one store a year may be a realistic goal because we want to open (each) new location carefully. When it reaches the certain level, we could accelerate." Prices at Muji's Canadian stores will be higher than in the U.S. according to Mr. Tsunoda. This is due to higher operating costs. To keep prices low, "we may have to squeeze profit margin," Mr. Tsunoda said, though he noted a lower margin could slow the pace of expansion. Muji will offer about 2,800 items in Canada, versus 3,500 in the United States and more than 7,000 in Japan. Muji's first Canadian location opens this November at Toronto's Atrium On Bay. The store will be almost 4,400 square feet, smaller than most of its U.S. locations. Two further Toronto locations are expected to follow in 2015 and sources confirm that landlords in Vancouver have been in talks to bring Muji to Canada's West Coast. Building a solid foundation in Toronto first, will help hold down distribution costs, Mr. Tsunoda said. Interestingly, Muji isn't using a Canadian brokerage to secure Canadian retail space. Rather, the retailer is coordinating securing its own Canadian leases. This is according to Uniqlo's Canadian broker, who we initially expected was involved with Muji's Canadian expansion. Known for being innovative and its products being affordable and unbranded, Muji carries various household items, furniture, appliances, stationary and apparel. With hundreds of stores worldwide, it saves money by avoiding locating stores in high-rent areas and spends little to nothing on market research and advertising. Muji is short for Mujirushi Ryohin, or no-brand superior items, and was founded in 1980 as the private-label brand of a major supermarket chain (not unlike Canadian brand Joe Fresh). Muji currently operates nine American stores. Five are in New York City, and four are in California (San Francisco, San Jose, Hollywood, and Santa Monica). 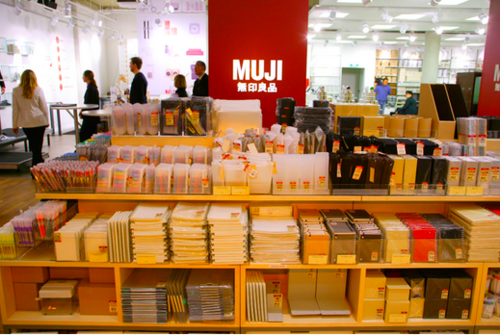 We'll update this article when we learn more about Muji's Canadian store expansion.